It’s no wonder that so many young families are flocking to the established northern neighbourhood of Brampton. Conveniently situated near Highway 410 and the idyllic Heart Lake Conservation area, the new Gates of Countryside development by Starlane Homes has the best of two worlds: the calm that comes with living near lush parks & ravine trails and easy access to shopping, schools, recreation and transit. The project is made up of a great selection of singles up to 3,263 sq. 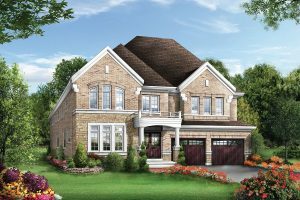 ft. on 38’ and 47’ lots, starting from $519,900. And for a limited time, buyers will receive up to $10,000 in upgrades when they purchase any Starlane home in Gates of Countryside. If you have trouble picking from all the available interior options, decorating consultants at the design centre can help you choose from a number of fine finishes to make sure you get exactly what you’ve envisioned. The designs feature up to 5 bedrooms, multiple spacious rooms on the main floor and countless upgrade options. Each home maximizes use of space comfortably without compromising on the quality materials and craftsmanship that Starlane has built its reputation on. Located at the southwest corner of Dixie Road and Countryside Drive, Gates of Countryside is the prime place for a growing family. With shopping and movie theatres just down the street at Trinity Common Mall, as well as schools, the Turnberry Golf club and Loafer’s Lake recreation centre, you’ll be living in a complete and established neighbourhood. The rest of the GTA is just a short drive away thanks to the Highway 410 while Brampton Transit is also available to help make commuting easier.